Lou Adler is the CEO and founder of The Adler Group – a training and search firm helping companies implement Performance-based Hiring℠. Adler is the author of the Amazon top-10 best-seller, Hire With Your Head (John Wiley & Sons, 3rd Edition, 2007). His most recent book has just been published, The Essential Guide for Hiring & Getting Hired (Workbench, 2013). He is also the author of the award-winning Nightingale-Conant audio program, Talent Rules! Using Performance-based Hiring to Build Great Teams (2007). Adler holds an MBA from the University of California in Los Angeles and a BS in Mechanical Engineering from Clarkson University in New York. Book Lou for your next event! 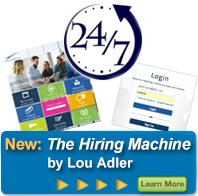 Lou Adler is available to speak to your audience of key decision makers, business leaders, and recruiting and hiring staff almost anywhere on the globe. To inquire about a specific date for your event, or to get pricing or more information about Lou’s current availability, please contact us at 888.878.1388, info@louadlergroup.com or complete our online contact form. A team member will get back to you immediately. Lou’s talks are always highly interactive, game-changing, and thought-provoking, and range from one hour to half-day hands-on workshops.